High school freshman Anya Corazon was tapped by the mysterious Spider Society to become their Hunter. 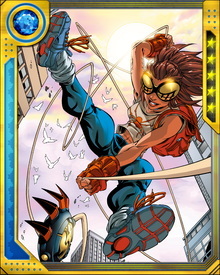 A magical tattoo endowed her with spider-like powers, including the ability to manifest an exoskeleton and cling to walls. 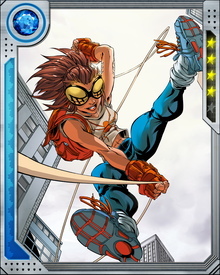 She had no native web-shooting ability but created small eight-legged discs on cables and used them to swing from buildings and entangle opponents.